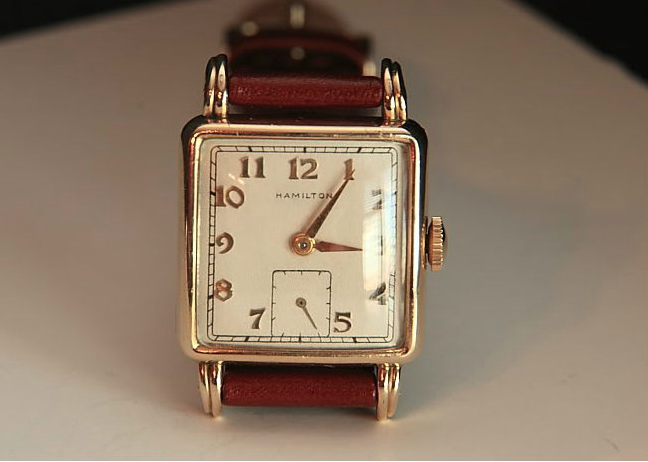 In 1948 Hamilton transitioned away from their 6/0 sized movements and adopted newer-designed, slightly smaller, 8/0 sized movements - the 17 jewel 747 movement with the sub second hand at 6 and the 18 jewel 748 movement with center sweep second hand. One of the 747 models introduced in 1948 was the Eric. The Eric is a larger watch in comparison to some of it's peers. It's easiest to identify by the square dial along with the squared, fluted lugs. Models are prone to wear through on the tops of the lugs, near the corners of the crystal. The Eric came in two different dial options. One is a butler-finished AGN dial with numerals and the other is a two-tone white / butler finished dial with numbers and markers. The Eric is sometimes confused with the Dewitt, from the same period. The Dewitt is slightly smaller, has a white-finished dial and although the lugs are similar, the inside and outside of the Dewitt's lugs are different lengths. 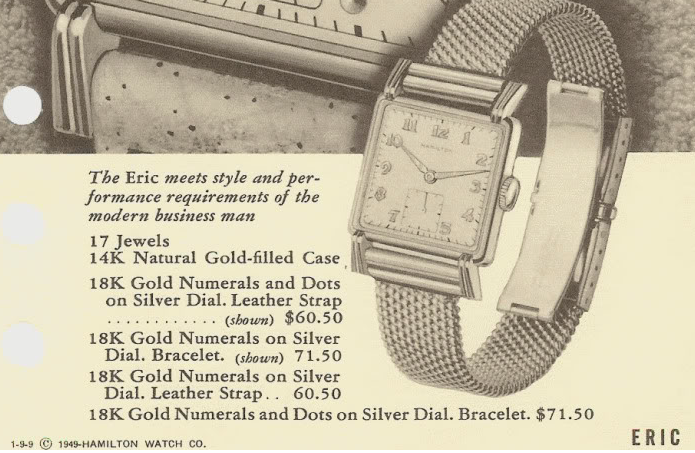 Here's a couple of photos of an Eric with the all numeral dial complete with it's original bracelet made by Kreisler, just like as shown in the catalog. 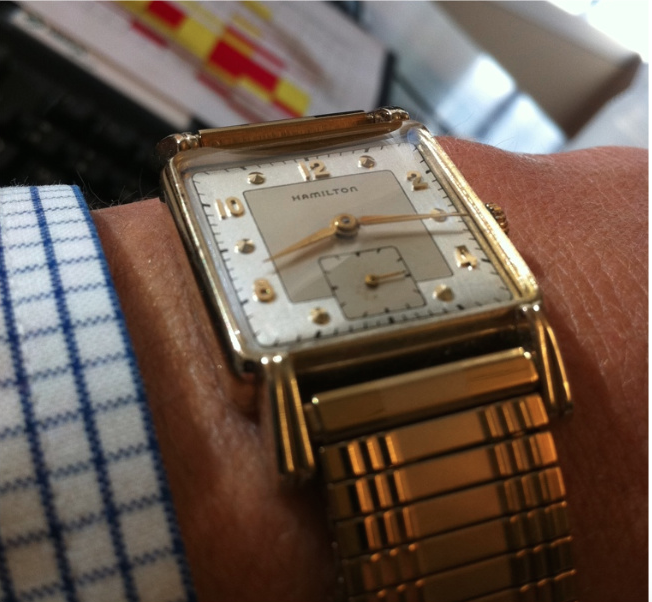 How much would the 1948 AGN Eric Hamilton cost if it was in very poor condition but the mechanism still worked and the watch still kept time? Also it has a leather band not a metal. Look at sold listings for similar watches on eBay. A price of $25 - $40 is not unrealistic. You're basically describing a "parts watch". 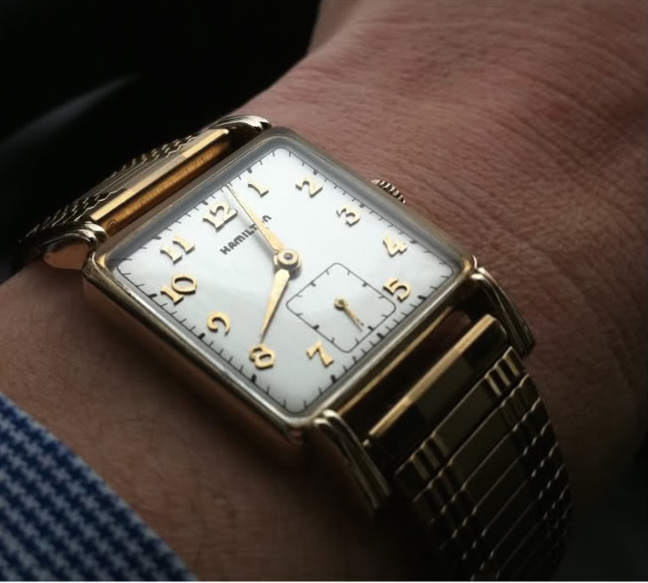 It could be restored, of course, but the value of a restored watch is in the restoration, not the starting watch (when it comes to a gold filled model like the Eric). Thanks, I actually like the style of it in poor condition because it adds a special look to the watch if you get what i'm saying. Dan, I have what I believe to be an Eric that belonged to my great grandfather. It's definitely the 747 movement, serial Y47828. I've been wearing it occasionally, mostly to Mass, but lately it's stopped running intermittently. You say the 747 is an easy movement to work on, but I'm reluctant to disassemble this particular heirloom. Do I try to take it to a jeweler? Do I buy some movements on eBay to practice? I know it's a personal decision, but any insight would be appreciated! Your blog is fascinating. Your work is impressive and your dedication to documenting and sharing it is inspiring. Any competent watchmaker can clean and oil your watch. A jeweler will just send it out and charge you a markup. I got started in this hobby in a similar manner - I had to learn how to fix a pocket watch because a watchmaker didn’t want to work on it. He would work on Hamiltons though. Doing it yourself is possible but be prepared to spend a fair amount on the tools needed to do it right. If you email me I can give you some recommendations.